It’s about time I reported on Disney’s latest release, Maleficent. When a few of us from the Monash Fairy Tale Salon went to see the film at the cinema, we had mixed feelings. Two of our members, Dr Rebecca-Anne Do Rozario and Louisa John-Krol have reviewed Maleficent on their blogs. You can read Rebecca-Anne’s here and Louisa’s here. What got me thinking was Disney’s creation of the villain, Maleficent, in the 1959 animated film Sleeping Beauty. She’s an all-powerful, wholly evil fairy, who terrorises the heroine throughout the entire film, and eventually transforms into a giant dragon to have a final showdown with the prince. 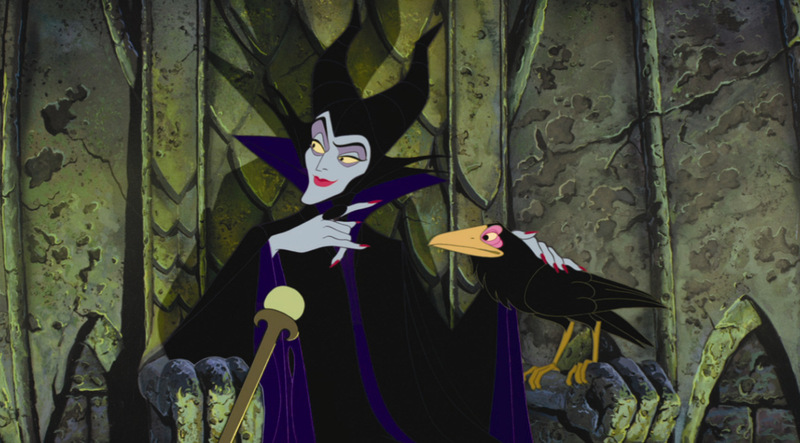 While Maleficent is the central and constant source of evil in Disney’s 1959 animated film, the character doesn’t hold such a strong role in earlier literary antecedents. In European literary fairy-tale history, the tale has been through several incarnations. In the 1630s in Italy, Giambattista Basile wrote “Sole, Luna e Talia” (Sun, Moon and Talia). Then during the fairy-tale vogue of seventeenth-century France, Charles Perrault published “La Belle au Bois Dormant” (The Sleeping Beauty in the Wood). And of course there’s Jacob and Wilhelm Grimm’s nineteenth-century German rendition “Dornröschen” (Little Briar Rose). In Basile’s version, there is no scorned fairy at all. At the heroine’s birth, her father simply consults his seers and wise men, who inform him that harm will come to his daughter from a sharp piece of flax. And indeed, the prophecy is realised when a piece of flax becomes lodged under her fingernail (ouch!) and she falls into the famous death-like sleep. The villain only appears later in the tale, after the heroine has been raped by a wandering king during her slumber and has given birth to twins . Despite this disturbing start to their relationship, the pair decide to give it a go as a couple. Except the king hasn’t been completely honest. ‘Oh, by the way, honey, I’m already married to an ogress who likes to eat small children … Hey, have you seen the twins? ?’ The bloodthirsty scorned wife becomes the villain of Basile’s tale, and is eventually burned alive to delight of the happy couple. Perrault’s version introduces the scorned fairy that would become Disney’s Maleficent. At the heroine’s birth, a celebration is held and seven fairies are invited, but one is forgotten. Granted, nobody has heard from her in fifty years so they assume she’s dead. But she turns up looking like a sour grape and sulks through the celebration before cursing the baby. But this is the last we hear of the nameless fairy, who is more sulky teenager than arch nemesis. The real villain is still the cannibalistic ogress carried over from Basile’s version – though re-written as the hero’s mother to avoid the taboo issue of adultery. Again she attempts to eat the heroine’s twins (born within wedlock this time) and again she is eventually defeated – this time thrown into a vat of snakes and vipers. Nice one, Perrault. Finally, the Grimms’ “Dornröschen” begins in a similar fashion to Perrault’s tale, except twelve fairies are invited and the thirteenth is forgotten, causing her to curse the baby. The reasoning behind this always cracks me up though – the king only has twelve gold plates, so he could only invite twelve fairies. Really? You’re a king. Buy an extra plate. But then there would be no story, would there? Again, the uninvited fairy is nameless and isn’t heard from after the beginning of the tale. But in this version, the second half of the tale is missing – no pregnancy, no twins, no bloodthirsty, evil ogress to be the villain. The story simply ends with the heroine’s wedding to the prince. It seems to me that Disney had to make some choices here. We know they were familiar with both the Perrault and Grimm versions, and so were aware of the cannibalistic ogress, who would have made a great villain. Can you imagine her on the big screen? However, using this character would mean showing the heroine having children. Disney films typically end with marriage, seldom venturing into the post-marriage experience of heroines. And so they had to find another villain. Thus, the uninvited fairy was made larger than life and given an unforgettable name – Maleficent. Belinda Calderone is the chief organiser of the Monash Fairy Tale Salon. She is currently teaching and completing her PhD in Literary Studies at Monash University. Her thesis is entitled Mothers, Monsters and Midwives: The Evolution of Motherhood in European Fairy Tales. She has published and given conference papers on various aspects of the fairy tale genre and has a forthcoming book chapter, “The Monster Inside Me: Unnatural Births in Early Modern Italian and French Fairy Tales” in Beyond the Monstrous: Reading from the Cultural Imaginary. View Belinda’s academic profile at monash.academia.edu/BelindaCalderone or contact her at belinda.calderone@monash.edu. Wondering what to do tomorrow night in Melbourne? Look no further! Australian author Kate Forsyth will be giving a special fairy tale talk at The Wheeler Centre from 6.30pm-8.30pm. Forsyth is an award-winning and internationally-acclaimed writer, who has brought us such books as Bitter Greens and The Wild Girl. In this talk, she will illuminate the lost origins of many well-known tales and the reason why fairy tales continue to be told and retold. I was very lucky to see her present at the inaugural conference for the Australian Fairy Tale Society last June, and so I have no doubt that it will be a fascinating talk! For more information and for bookings, click here.